Af Jochnick BV - 11.3%, Robert & Alexander af Jochnick & family - 9.7%, Fourth Swedish National Pension Fund (AP4) - 8.8%, Jonas af Jochnick & Family - 7.8%, First Swedish National Pension Fund (AP1) - 4.4%, Handelsbanken Fonder AB - 4.0%. (Top six shareholders as of 31st Decmeber, 2017). Jochnick family combined is the single largest owner of Oriflame with close to 30% of the share capital and voting rights as of 2017. 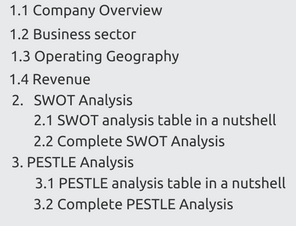 The SWOT Analysis for Oriflame is presented below in a nutshell. 1. Depends majorly on word of mouth for its promotion. 1. Mature and consistent brand: Oriflame is a 51-year-old beauty company with a direct reach in more than 60 countries around the globe. Since its genesis in 1967, it has been acing in the beauty sector. With a range of more than 400 products promoting beauty, personal health and wellness, Oriflame portrays itself as a competent and sophisticated brand. One of the major strategic differentiating factor for the company is its entrepreneurial corporate culture which has led to its brand success. 2. Strong and loyal customer base: Oriflame has a network of direct sellers who are also the target audience of the brand. With a constantly growing network and strategy that aces retention of the target audience, the brand is continuously flourishing. Despite the fact that the major marketing tool is direct selling and the awareness is majorly through the word of mouth, only with the help of its strong and a loyal customer base, it is able to thrive in such a competitive market. Also, to keep its audience intact, Oriflame does bring out regular schemes and offers for its consumers. 3. Promotes natural beauty products: Today’s market has a keen tilt towards the organic and natural. The beauty and wellness sector especially, among the upper class, has an exponentially ever growing demand of natural products. From soaps, to spas, natural products are in major demand these days. Here is what Oriflame is a pro at-natural beauty products. With the surety and the trust of the brand and its makers, Oriflame has been able to ace the business of natural beauty products. The audience believes the conduct of the company and promotes the brand even further, majorly for its beauty variants. 4. Balanced geographic footprint with strong consumer outreach: Oriflame has developed a balanced global footprint with operations in more than 60 countires which are primarily growing markets with respect to consumer spending on beauty products. As per Oriflame’s Annual Report 2017, the share of Operating Profit from Asia and Turkey has grown from a meagre 9% in 2010 to 50% in 2017. Current as well as past trends hint towards a significant increase in the spending capacity of the average working female in these countries. Oriflame’s distribution model is expressly based upon the entrepreneurial spirit and network of beauty consultants, which helps the company to reach out to the consumers at a micro level ensuring ease of access. Hence through it’s consultants, Oriflame is better poised to tap into this nascent spending power and the resulting focus on all-round well-being. 5. Offer catalogues released monthly and bi-monthly: Oriflame releases monthly and bi-monthly catalogues that disseminate information about their various brands and collaborations. Every issue of the catalogue has at least one new entry of beauty, wellness or personal care product and sometimes contains even testers for their newly released fragrances. The brand does not let their target audience remain unaware of any development in their product collection. The collaborations with designers are also promoted in the catalogue only. These create a powerful impact on the audience and increase their desirability to buy the brand. 6. Business model suited to modern social networking: Oriflame promotes women selling their products for who would know better about beauty and wellness than women. Also, the women have stronger social circles around in the neighborhood and workplace which makes them a good prospect seller. The fact that the women are great communicators is not hidden from anyone and for a brand that uses direct selling as its major marketing tool, keeping women as the major sponsors works really well. The company works through more than 3.1 million independent Consultants who use various direct selling promotional techniques using digital and traditional networking tools to sell its products directly to friends and family. The company has empowered its consultants with the latest digital tools such as The Oriflame app which helps them to focus on products, offers and managing orders. The Oriflame SkinExpert app helps them in consultative selling of Oriflame’s Skin Care routines. They also use the word of mouth to convince their peers and the others following the chain to buy the Oriflame products which people already have knowledge about. 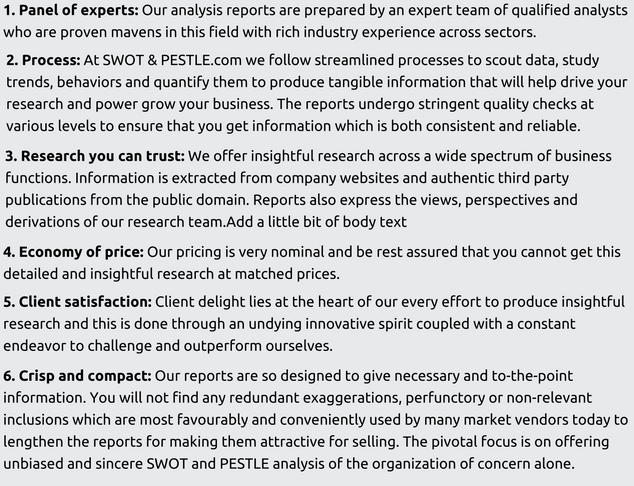 The PESTLE Analysis for Oriflame is presented below in a nutshell. 1. Compliance to government regulations of the places where they have manufacturing units: The political factors include the rules and policies of the government in which the companies have been working. Apart from the host countries’ government policies, the several import policies of the regions play a vital role in the success of the Oriflame. With the beginning of globalization, the political factors also have a positive role in the business industry. They are present in 5 countries with manufacturing units: Russia, China, India, Sweden and Poland, and comply with the political nuances in all of them. 2. The exit of UK from the Eurozone: As per Oriflame’s 2017 Annual Report the UK is the second largest single shareholder in the company with 12.7% equity. As such, investment on part of shareholders and leeway to a Swedish firm on part of the government is bound to take a hit. Scepticism in the UK regarding the Schengen Area and its subsequent exit will mean changes in how goods and people move in between the European nations. This will mean new regulations to comply with in UK which is a significant market. Also, new regulations might come up regarding use of independent consultants for sales. 3. Global supply and distribution becomes a function of political issues among inter- country trading: Supply and distribution planning with Oriflame’s vast network of suppliers and sales companies is the basis of its progress. While Supply planning plans greater than 600M units annually from around 60 suppliers worldwide, Distribution planning makes sure that there is always on-time delivery in more than 60 markets in five regions. Logistics manage and regulate the even and hindrance-free physical delivery of products. Their responsibility is to distribute goods from supplier to hubs and from the hubs to markets. The company intends to align its legal structure with the Group operations. These modifications may result in the change of domicile from Luxembourg to Switzerland within the next few years. 1. Major initiatives towards Environmental Sustainability: Oriflame with its 5 breakthrough initiatives proudly strives towards Sustainability. The initiatives include Oriflame’s EcoBeauty range, which is the first global cosmetics range certified by Fairtrade®. EcoBeauty is constantly improving the quality of lives of many. The proceeds from the sales of EcoBeauty go in providing training in biodiversity, organic farming and natural resource management of the farming communities. It also helps in empowering the women of those communties. The secnd initotive is Microbeads. Oriflame does not use harmful plastic microbeads which cause plastic particle water pollution and pose a serious threat to the aquatic life. Instead, Oriflame uses biodegradable, natural-origin beads in all of their exfoliating products, thus preventing the environment of the plastic particle hazard. The third major initiative or Oriflame is its Wellness Factory in Rourkee, India. It has roof-mounted solar panels to use the sun to reduce power consumption for which it has received LEED® (Leadership in Energy and Environmental Design) Gold certification. Next comes the Oriflame Childhood Foundation, which is a commitment has been made by Oriflame to donate €1 million to the World Childhood Foundation through sales of Tenderly Promise, thereby contributing to the safety, health and happiness of children in need. Fourth of the five initiatives is Recyclable Future. In 2016, 99% of Oriflame’s catalogue paper came from credibly certified forests. 2. Committed to reducing the impact of business on the environment: With the ultimate aim to reach their goal of business-wide environmental sustainability, their main issues of focus include sourcing only those materials which are either renewable or recycled, making sure that no emissions make way to water and there’s no negative impact on the availability of water, achieving neutral or net positive carbon emissions, sending no waste to landfill and developing sites and operations which pose no negative impact. Commitments have been made under each of the above five areas. To ensure the sustainability of this progress, most of these commitments emphasize on taking action where Oriflame’s business makes the best and biggest impact, and where it can bring about real change. 3. LEED Certification initiatives at manufacturing facilities: Leadership in Energy and Environmental Design (LEED®) is a green building certification program that identifies all the top-notch building strategies and practices. Oriflame is working towards achieving LEED® certification for all its new construction and major renovations. In 2015, The Manufacturing facility at Noginsk, Russia was honored with a LEED® Silver certification using the LEED® for its New Construction rating system. Also, the New Manufacturing site at Roorkee, India received a Gold certification under the LEED® for the same. Oriflame Holding AG SWOT and PESTLE analysis has been conducted by Astha Gaur and reviewed by senior analysts from Barakaat Consulting. 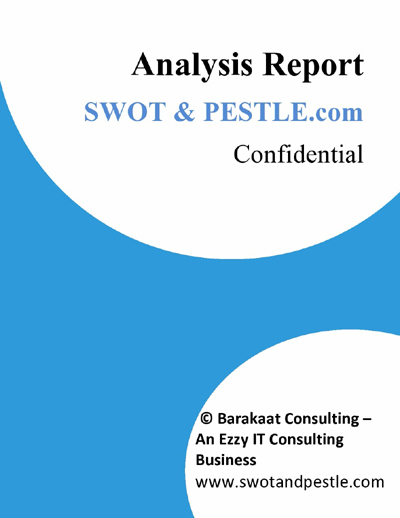 Copyright of Oriflame Holding Ag SWOT and PESTLE Analysis is the property of Barakaat Consulting. Please refer to the Terms and Conditions and Disclaimer for usage guidelines.